Netflix's new Quincy Jones documentary reveals the secrets to aging like a legend. 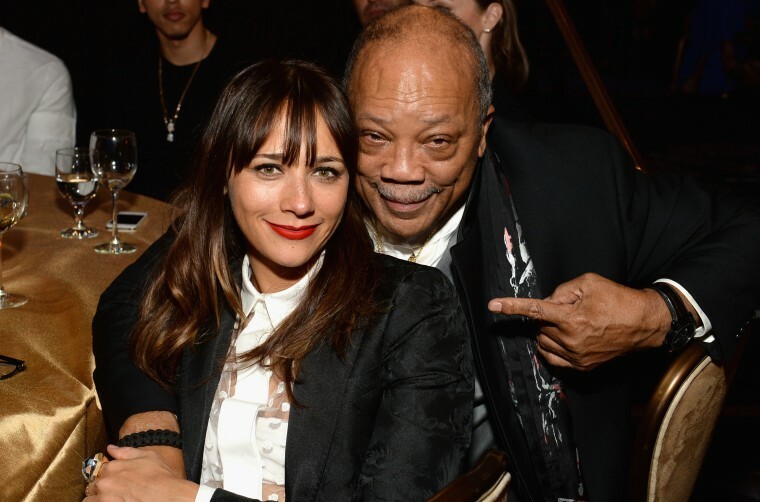 "QUINCY," a new Netflix documentary about the life of music legend Quincy Jones, is an inspiring portrait of the artist lovingly co-directed and co-written by his daughter, Rashida Jones and Alan Hicks. His meteoric rise — from a poor child looking for a way out of the South side of Chicago, to producer of the best-selling album and single of all time — was the direct result of a tireless work ethic, rigid determination, a relentless thirst for knowledge and a big love of life. During the trajectory of his 85-years on earth, the achievements he’s amassed, musical and otherwise, are almost impossible to enumerate. Here’s what we learned about how to age like a legend, from watching the real live legend on TV. Jones experienced tragedy in his young life — his mother was taken away because she suffered from mental illness, and he thought he’d become a gangster until he was 11. But when he first laid eyes on a piano, his destiny became clear: “Music was the one thing that offered me my freedom,” he says in the documentary. Dedicating himself to the mastery of music (trumpet and piano to start), he started playing nightclubs at 14 working with Ray Charles, who himself was just 16, and became laser focused on growing as a musician and songwriter. It wasn’t long before he started touring Europe (which he did as a teen and young adult) and working with the likes of Billie Holliday, Count Basie, Frank Sinatra and Dizzy Gillespie, arranging and conducting their music and immersing himself in the culture of each country he visited. To this day, Jones sees each day as a new opportunity to learn and there’s a reason learning may have come easy: One study found that musical training in childhood literally changes the structure of your brain and how it works, pointing to enhanced verbal abilities, non-verbal reasoning and making it easier to learn a second language. When daughter Rashida asks Jones how he balances his ego and his art, he credits his lofty ambitions with keeping his ego in check, saying, “You have to dream so big that you can’t get an ego, because you can’t fulfill all those dreams.” So far, Jones’ dreams have led him from a career as a session musician, to composing and arranging albums for some of his favorite artists, to composing music for films and television, to producing television and movies, to producing the biggest selling album and single of all time, to the launch of a magazine (“Vibe”) and television network (Qwest TV, the Netflix of jazz). At the ripe age of 85, Jones still seems to be going strong. After all, there may be some truth to the adage ‘you’re only as old as you feel’ — a study published in Frontiers in Aging Neuroscience found elderly people who think of themselves as younger than their real age predicted a younger brain age, as well. So, if your muse is still singing, why retire? Many of Jones personal and professional relationships were lifelong; he remained close to Sinatra and Charles until they passed and wears the pinky ring Sinatra gave him to this day. And throughout the film, he’s constantly embracing someone he calls a friend. A scene toward the end of the doc shows how Jones could pick up a phone and get the likes of Oprah, Will Smith, Lady Gaga and President Obama to show up at an event. What’s more, his tremendous capacity for connection is actually healthy: one study of almost 300,000 adults of various ages found people who strongly value their friendships had a more positive outlook about their well-being, and older adults supported by family and friends predicted “higher subjective well-being” over an 8-year span. Jones was once mentored by the likes of Ray Charles, Frank Sinatra and Count Basie. “Mentoring is about one person that sees that glimmer in your eye and those question marks in your eyes,” Jones says. He’s certainly paid mentoring forward: he cast Oprah Winfrey in the film version of “The Color Purple” after watching her host “AM Chicago,” and had rapper Will Smith audition for “Fresh Prince of Bel Air,” the show that made him a household name. Research shows mentoring can have a positive effect on protégé attitudes, open their eyes to different possibilities and motivate them to seek out new experiences. Mentoring also helps protégés stay focused, enhances familial relationships and facilitates better networking practices. Jones still makes it his business to mentor young talent, like British singer and composer Jacob Collier. Throughout the documentary, Jones owns his mistakes — from the failures of his three marriages, to his workaholism at the expense of time spent with his seven kids. Perhaps this humility has something to do with why so many scenes depict him basking in the love of his children. What wasn’t shown in the doc: After giving two candid interviews that spilled some big-time tea earlier this year, Jones took to Twitter to publicly apologize and bow out of future interviews after his six daughters held an "intervention." "I'm so grateful for my daughters because they aren't afraid to stand up to their daddy," he wrote. "I am an imperfect human and I'm not afraid to say it. And I'm sorry and I'm not afraid to say it." Though the documentary reveals that Jones almost died twice (he suffered two midlife brain aneurisms and drinking put him in a diabetic coma at 82), he eventually takes heed of medical professionals and changes his ways — even resuming a long-tabled yoga practice (there’s footage of him practicing in the 70s or 80s after his brain surgeries). Yet, the man has no interest in letting go of the work he loves. Scientifically, this may contribute to Jones’ mental acuity: we see him doing word scrambles and crossword puzzles — some studies have shown games like crossword puzzles can help delay onset of memory decline in the preclinical stages of dementia.